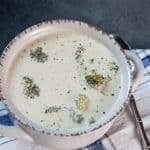 Broccoli Alfredo Soup is a low carb creamy Italian sausage soup that is the ultimate in savory flavor. If you're looking for a flavor-packed, rich and creamy bowl of decadent comfort food, this is what you need to make! In a large stockpot, brown sausage with onion and optional jalapeno. Add bone broth, Alfredo sauce, broccoli, and Italian seasoning, and bring to a slow simmer. Whisk in glucomannan and simmer for a few more moments, or until the soup begins to thicken. Click Here for Weekly Menus & Shopping Lists!